This article is about the Hive Ogres. For the expansion, see Forsaken (expansion). "Conjured with but one purpose... to die." 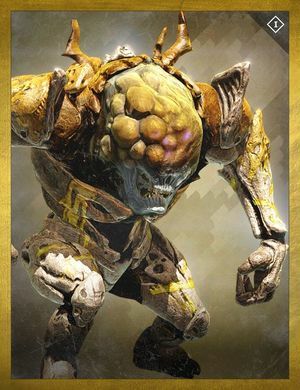 The Forsaken are a pair of Hive Ogres that are bred to be sacrifices to Oryx. Their names are Malgor, the Forsaken, and Thogar, the Forsaken. They are killed by the player as part of the Ritual of Sacrifice Quest. One of the two Forsaken Ogres.